Ultra fine-grained metals can show exceptional ductility, known as superplasticity, during sheet forming. The higher ductility of superplastic metals makes it possible to form large and complex components in a single operation without joints or rivets. The result is less waste, lower weight and manufacturing costs, high precision and lack of residual stress associated with welding which makes components ideal for aerospace, automotive and other applications. Superplastic forming of advanced metallic materials summarises key recent research on this important process. Part one reviews types of superplastic metals, standards for superplastic forming, processes and equipment. Part two discusses ways of modelling superplastic forming processes whilst the final part of the book considers applications, including superplastic forming of titanium, aluminium and magnesium alloys. 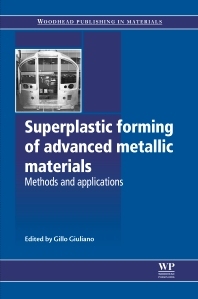 With its distinguished editor and international team of contributors, Superplastic forming of advanced metallic materials is a valuable reference for metallurgists and engineers in such sectors as aerospace and automotive engineering. Note: The Publishers wish to point out an error in the authorship of Chapter 3 which was originally listed as: G. Bernhart, Clément Ader Institute, France. The correct authorship is: G Bernhart, P. Lours, T. Cutard, V. Velay, Ecole des Mines Albi, France and F. Nazaret, Aurock, France. The Publishers apologise to the authors for this error. Gillo Giuliano works in the Department of Mechanics, Structures and Environment at the University of Cassino, Italy. Professor Giuliano is internationally-known for his work on superplasticity.